I’ll just skip the part where I make excuses for why I haven’t written lately and just get on with the update for March. The city council typically has two meetings per month, but we had to move our first meeting in March due to precinct caucuses (state law doesn’t allow council meetings on caucus night) so we had meetings on February 29 and March 15. Appearances – Police Chief Revering gave an award to a mother and son (Jennifer Auger and Cameron Auger-Pippi) who called the police on some suspicious activity and ended up preventing a domestic violence situation. Commissions – We appointed a bunch of commissioners to city commissions as part of the annual reappointment process. Work continues on refining the process for recruiting, selecting and appointing commissioners to ensure maximum success. Donations – The city made donations to the NEAR and PRISIM food shelves. The money used to make the donations was raised by Crystal council members and commissioners who volunteered to bag groceries at Cub Foods in 2015. Light Rail – This topic has been talked about quite a bit. We passed a resolution that did not affirm or deny municipal consent for the Blue Line Extension. Read more here. Public Works Equipment and Projects – We approved a number of new items for public works, including a new sewer camera system, a box plow attachment, and a some new sewer pumps (yay!). All of these were items that were in the budget for the year. We also approved this year’s sewer relining project and the next steps in this year’s street and alley reconstruction projects. One exciting thing we did this year is purchased some equipment and shared the cost with Robbinsdale. This will help both cities save cost while giving us both access to equipment we need. This was a great, creative solution brought forth by our public works department. Police Annual Report – We reviewed the PD’s annual report, which is now online for you to review as well. Local Board of Appeal and Equalization – We reviewed the local board of appeal and equalization, which is a fancy way of saying we talked with the assessors from the county to refresh ourselves on the process for appealing tax valuations. Much more on this to come. 36th and Regent Study – A few years ago, the council looked at options for “enhancing” (or some may say “correcting”) the traffic situation at 36th and Regent. One option that was proposed was a mini-roundabout. The council didn’t take that option off the table, but we also didn’t love it. I’ll be door-knocking that neighborhood with a proposed drawing to see how residents in the area feel about the idea. Street Maintenance Fund – We are currently in phase 15 of a 16 phase project to reconstruct every street in Crystal. Once that ends, we will enter a maintenance mode, to ensure that we maintain the roads we rebuilt. The council had the first of what will be many conversations about how to approach maintenance going forward, with an eye toward eliminating special assessments for maintenance. 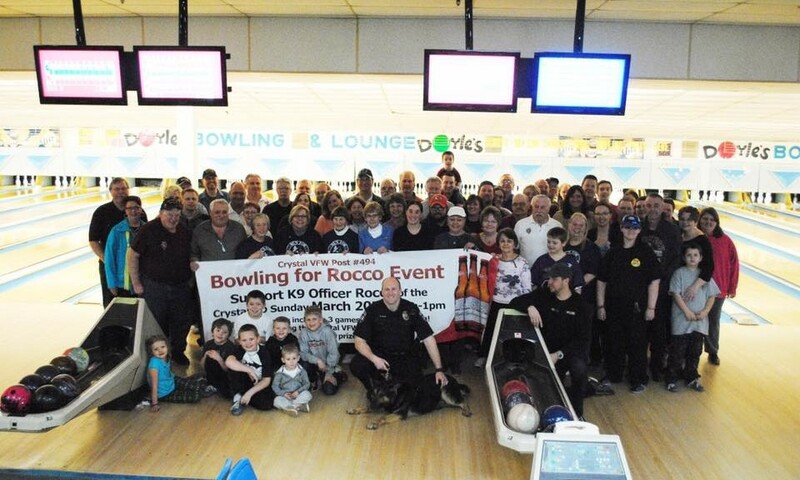 There were quite a few charity bowling tournaments in the past few weeks- The Light of Crystal, Beyond the Yellow Ribbon, and bowling for Rocco the police K9. I bought a bowling ball. The picture is from the Rocco event. On March 19, the Crystal Council joined West Metro Fire and bagged groceries for tips during the Firefighters Fighting Hunger drive. Pictures here. While my blog posting has been light, I’ve been getting better at Facebook, so you can keep up with me there, if you are so inclined.